Our service team is available in emergencies around the clock, on all calendar days for you! A well-functioning service, even after delivery of a system, is a basic prerequisite for the success of a company. For this reason, we have attached particular importance to an absolutely reliable service area since the company was founded. The fact that this decision was and is the right one reflects the extremely successful development of our company. Our customers producing in Germany and many other countries of the world expect an all-round service. 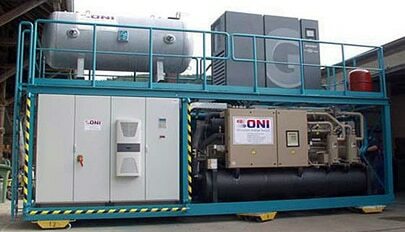 With our service network and the globally oriented data information network, we can contact any ONI plant. After your approval, we can switch to your cooling system via the data network in order to read and evaluate status reports, for example. Target values can also be adjusted and any deviations that may occur can be detected in good time. System malfunctions are almost completely eliminated by this accompanying supervision. A basic prerequisite for problem-free and energy-saving operation is, of course, regular maintenance of the systems by our specialists. In addition to ONI systems, third-party products are of course also serviced by arrangement.